The Hytrol SB Conveyor (Medium Duty Slider Bed Conveyor) is a horizontal slider bed conveyor designed with channel frames and bolt in pans. 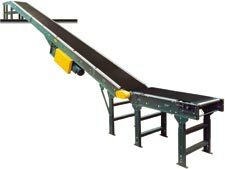 Frame design makes it ideal for matching up with roller bed conveyors. The Hytrol RB Conveyor is designed to move heavier loads. Roller bed design reduces belt friction and provides greater capacity. Applications include: assembly, inspection and packing operations. The Model 190-LRC – Medium Duty Curve (V-Belt) is a medium duty live roller curve that provides a positive drive for negotiating 30°, 45°, 60°, and 90° turns. It may be self-powered or can be slave driven from 190-ACC, LRS, or LRSS conveyors. The Model SBI is a floor-to-floor incline conveyor slider bed. It is equipped with an adjustable double nose-over at the discharge end to insure a smooth transfer from incline to horizontal plane. Inclines are easily adjusted up to 30°. This conveyor can also be used as a booster conveyor in gravity flow systems. Motor – 1 HP C-Face “SSB” Series Brake Motor – 2 HP max. Capacity-100 lbs. per linear foot.